If you want to make the perfect Christmas pudding, there is one ingredient that you’ll need in abundance which will make all the difference to the end result. And that magic ingredient is… time. Yes – the perfect Christmas pudding isn’t something that can be whipped up in an instant. It’s something that requires a bit of time, patience and some organisation as there are quite a few ingredients to include, and you don’t want to forget any of them!So although your pudding will initially take five hours to steam, and a further two hours of steaming on the day it is to be served, you’ll need six to eight weeks to allow the Christmas pudding to mature – so plan ahead and you’ll be joyful and triumphant! So let’s assume that this is your first foray into Christmas pudding territory. You may or may not know that a Christmas pudding requires a lengthy period of steaming; this is the way that they are cooked, which keeps the pudding soft and moist but firm, whilst retaining a crumbly texture that melts in the mouth. Traditionally, puddings were directly steamed inside special pudding cloths and lidded with greaseproof paper or linen. 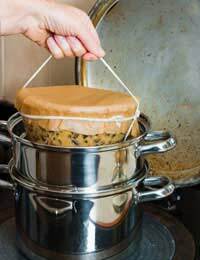 The modern equivalent is much easier to use; a greased china pudding basin covered with doubled pleated foil (to allow for expansion), tightened with string and placed directly into a steamer. Make sure that the side of foil that comes into contact with the pudding is buttered, to prevent it sticking. When securing the foil with string, it’s also a good idea to use a little extra string to make a handle, so that it’s much easier to pull the pudding from the saucepan. A steamer, if you do not already have one, can be bought relatively cheaply and will fit most saucepans. The pudding is cooked by the steam alone, so you’ll need to fill your saucepan around three quarters full with water. Don’t forget to check regularly in case the water looks as though it’s running low. If you don’t have a steamer, an alternative is to sit the pudding basin on a small upturned plate or alternatively a wad of crumpled foil inside a saucepan so that the pudding sits above the water line. This does require more care as you’ll have to ensure that the water doesn’t bubble over the top of the foil, or boil away completely. A good tip is to keep some hot or near-boiled water ready in a kettle should you need to top up. The classic ingredients in most Christmas puddings include spices such as nutmeg and cinnamon, dried or candied fruit, orange or lemon zest, nuts, and spirits. Of course, you may or may not have your preferences when it comes to exact ingredients. One person’s idea of a perfect Christmas pudding could well be another’s pudding nightmare. It’s all down to personal taste and this may mean that a bit of experimentation is in order before you truly find your own personal idea of perfection. The following recipe provides you with an excellent basis from which to start. 1.Grease the pudding basin lightly and line with the baking parchment. 2.Take the larger mixing bowl and add the currants, raisins, sultanas, candied peel, lemon zest, mixed spice, salt, sugar and breadcrumbs and mix lightly but thoroughly. 3. In the medium mixing bowl, take the rum, sherry or brandy and whisk together with the beaten eggs and milk. This can then be added to the larger mixing bowl, and stirred until evenly mixed. 4.Spoon the contents of the mixing bowl into the pudding basin. Make sure that it’s pressed down firmly before covering the surface with doubled foil. Make sure that the foil (which should have been greased on the underside) has an extra pleat in the middle to allow for the pudding to expand. Then secure the foil lid with string under the rim. 5. Next, carefully lower the pudding basin into your saucepan. Add boiling water so that around half to three quarters’ depth of the pudding basin is immersed. Place a lid on the saucepan and bring the water to the boil, keeping it boiling gently for around five hours. Remember to check the level of the water frequently. 6. After five hours, lift the pudding basin out of the pan and allow it to cool completely. Once it has cooled, remove it and then wrap it in greaseproof paper and foil. 7. The pudding can then be stored in a cool, dark place for 6-8 weeks whilst it matures. 8. On Christmas day, you’ll then need to steam the pudding as previously for a further two hours. Once steamed, it can be turned out onto a warmed serving plate and covered with warmed brandy and set alight, before being served with brandy butter or custard. While you've got the dried fruit out, why not make some 'Christmas cake' cupcakes for the festive season?